Today’s gift is a little bit of a beauty investment, but definitely a worthwhile one at that. 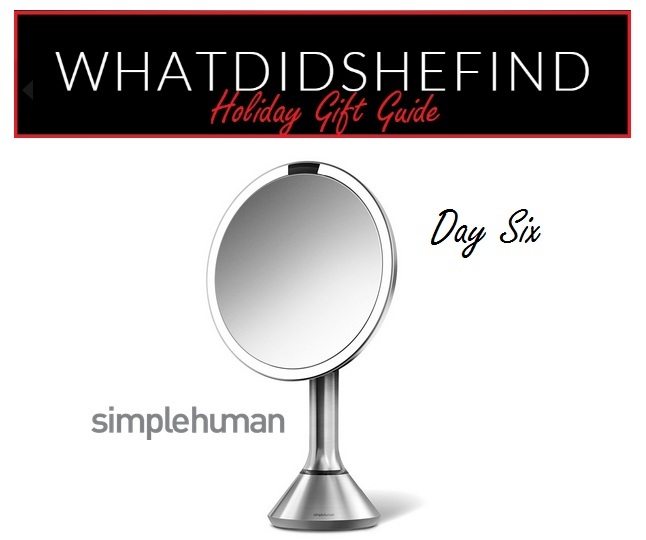 The simplehuman 8” Sensor Mirror is a game-changer in the makeup application department (I’ve had mine for about 6 months now and couldn’t imagine life without it). Magnifying at 5X, and with lighting that mimics natural sunlight (using tru-lux technology), this mirror allows you, “to see full color variation, so you’ll know when your makeup is color-correct and flawless” (simplehuman.com). From personal experience: this mirror allows you to see everything (even on the days when you may not want to). And while this level of detail may seem a little scary, it really does help to get the best results when applying makeup, or when grooming eyebrows/facial hair (making it a great gift for a man as well). Cordless and rechargeable through USB or adapter, (a single charge lasts up to or beyond 5 weeks depending on how often you use it), the mirror lights up as you approach it, so you don’t have to worry about turning it on and off (though there is a full “power off” button). This mirror retails for around $199.00, and can be purchased in Canada at Bed Bath & Beyond, or Home Outfitters. Both companies offer 20%-25% off discounts: Bed Bath & Beyond when you sign up for their email list (20% off), and Home Outfitters when you use their online/in-flyer coupons (typically 20% off, or 25% when you use your HBC credit card). I can’t say enough positive things about this mirror, it’s definitely worth checking out. And plus, you’re on the “nice list” this year, right? You deserve it.